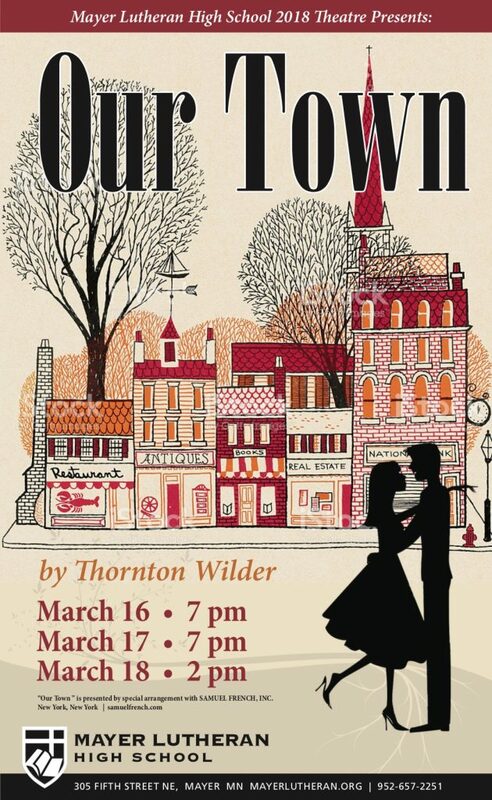 The Mayer Lutheran High School Drama Department presents Thornton Wilder’s beloved drama, Our Town. Performances are Friday and Saturday, March 16 and 17, at 7 PM and Sunday March 18 at 2 PM. Winner of the 1938 Pulitzer Prize for Drama, Our Town follows the small town of Grover’s Corners through three acts: “Daily Life,” “Love and Marriage,” and “Death and Eternity.” Narrated by a stage manager and performed with minimal props and sets, audiences follow the Webb and Gibbs families as their children fall in love, marry, and eventually – in one of the most famous scenes in American theatre – die. Thornton Wilder (1897-1975), born in Madison, Wisconsin, and educated at Yale and Princeton, was an accomplished novelist and playwright whose works explore the connection between the commonplace and the cosmic dimensions of human experience. The Bridge of San Luis Rey, one of his seven novels, won the Pulitzer Prize in 1928, and his next-to-last novel, The Eighth Day received the National Book Award (1968). Two of his four major plays garnered Pulitzer Prizes, Our Town (1938) and The Skin of Our Teeth (1943). His play, The Matchmaker, ran on Broadway for 486 performances (1955-1957), and was later adapted into the record-breaking musical Hello, Dolly! Mr. Wilder’s many honors include the Gold Medal for Fiction from the American Academy of Arts and Letters, the Presidential Medal of Freedom, and the National Book Committee’s Medal for Literature. He continues to be read and performed around the world. Our Town is performed at least once each day somewhere in this country, with his other major dramas and shorter plays not far behind. Our Town is presented by special arrangement with SAMUEL FRENCH, INC. New York, New York. For more information, visit samuelfrench.com.